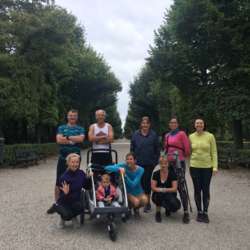 You must be a member of the Vienna Running Group to attend this activity. Would you like to join this group? For people who are not running in the training for the Vienna City Marathon (VCM) on Sunday, we will have our usual run in Schönbrunn. We will meet at 09:45 in Protected content - bags with dry clothes can be left in the Cafe before the run, make sure there is nothing valuable in them (any valuables left in your bag are left at your own risk). The closest station is U4 station Hietzing. Depart and start running: from the cafe at 10:00 am. Not run with us before? Are you worried about our pace? Firstly, don't be! And, secondly, why not just join us for brunch or a coffee after. We'd love to meet you! Thanks, and hope to see you Sunday!